One of the big features announced for developers at this year’s WWDC event was automated UI testing. This is something I think all developers should be doing in some capacity, whether with Apple’s tool or something else. C++ Renaissance? I’m not so sure. Leonardo da Vinci. Not to be confused with Leonardo da Turtle. I’ve seen various posts lately talking about a “C++ Renaissance”. I’m trying to make some sense of this, and mainly to figure out whether it’s true. 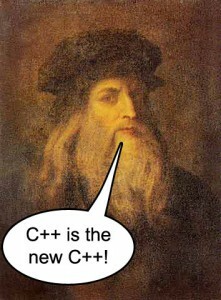 It seems there is some belief that just because there is a new C++ standard (C++11, formerly known as C++0x) there is a “renaissance”. Most of the posts I’ve seen on the subject are basically restatements and requotes from a recent interview with a couple guys on Microsoft’s Visual C++ team. So far all I can tell is that the VC++ guys are hyping their own product, and some people are buying into it. I haven’t heard of any widespread transition from Java/PHP/Python/Ruby/Perl/Objective-C/etc to C++. Server-side developers who are developing for maximum performance may use C++, but they probably already were before the so-called renaissance. Mobile developers are still primarily using Objective-C on iOS and Java on Android. Console game developers were already using C++. Embedded developers will continue (not start) to use C++ if they have the luxury; otherwise they’ll use C or assembler. Kernel developers will continue to use C.
So where exactly is the renaissance supposed to happen? Holy crap, iOS 5 finally lets you customize sounds! I used to customize all the sounds on my Windows Mobile phone (I feel dirty just saying I had one of those) back around ~2006, and I’ve always wished the iPhone would let me do it. It took a few years, but it finally happened. I’m surprised I haven’t seen this new feature mentioned anywhere. And on top of that, you’re not limited to the built-in alert sounds! 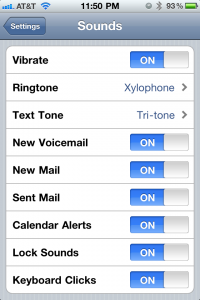 You can finally use any ringtone for any alert sound, whether you purchased it from iTunes or made it yourself for free. 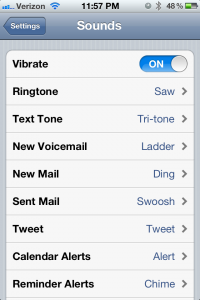 For example, I’m using a Saw ringtone to celebrate Halloween. If you’ll excuse me, I’m off to download some free video game ringtones. Over the weekend, I upgraded from an iPhone 4 on AT&T to an iPhone 4S on Verizon. For the most part, I’ve been happy with it. But I did have to fix a couple problems. Here are the problems I had, and the solutions I found. I recently started a video gaming podcast called Three Guys One Joystick with a couple of my best friends. We’re mostly talking about older games, but we’ll talk about newer ones (and maybe even mobile games) from time to time too. Check it out! Update: LiveHTTPHeaders 0.17 has been released, so this hack is no longer needed or recommended. LiveHTTPHeaders, one of my favorite Firefox plugins, hasn’t been officially updated for Firefox 4.0 compatibility yet. I hacked the .xpi file so it will install in FF4. If you’re impatient like me, grab it here. It’s working fine for me, but I can’t guarantee it will be 100% stable. Thanks for this addictive game. I’ve been playing it on my Nokia phone for over a year now. Since I love the game so much, I’ve ported it as a MediaPortal plugin (C#). I’ve used your base classes and added my own touch (multiple levels, scoring system, timed game, sound effects). You’re of course credited as the source for my plugin, and my plugin source is available to the public. Anyone interested in working on Pipes J2ME? A number of people have pointed out that my J2ME version of Pipes doesn’t work properly on some newer phones (especially those with touch screens, such as the Blackberry Storm). It is also lacking in features compared to my iPhone version. The fact is I simply don’t have the time or resources to maintain the J2ME version. I don’t have a J2ME phone anymore, and since I don’t make any money from the J2ME verison, I can’t justify buying development equipment. So my question is this: If I were to release the source, would anyone be willing to help out by adding new features?